Mongolia used to be the second, after Tibet , stronghold of Buddhist religion. The Mongols came into contact with Buddhism, Nestorian Christianity and Islam. Mongolia was converted to Tibetian Buddhism twice, first by the example of Khubilai Khan, grandson of Chingis Khaan, who adopted it as the state religion in 13th century, and again in 16th century, when Altan Khaan took buddhist vows. In the turn of 20th century each and every family was obliged to send one of their children to a monastery to become monk. In seven decades of Communism Buddhism was almost eradicated as more than 30,000 monks and priests were executed and another 70,000 exiled or imprisoned. But the liberalization of 1990 allowed its peaceful revival. Now more than 140 Buddhist monasteries have been set up anew. Under this newly found freedom of belief, other religions flocked in, including more than 30, mostly Christian, churches and cults. Another popular religion is Islam practiced by a 60,000 strong Kazakh minority in Bayan Olgii province. The second most important monastery in Mongolia is Amarbayasgalant Khiid, on the southern slope of Buren khaan in Selenge aimag. 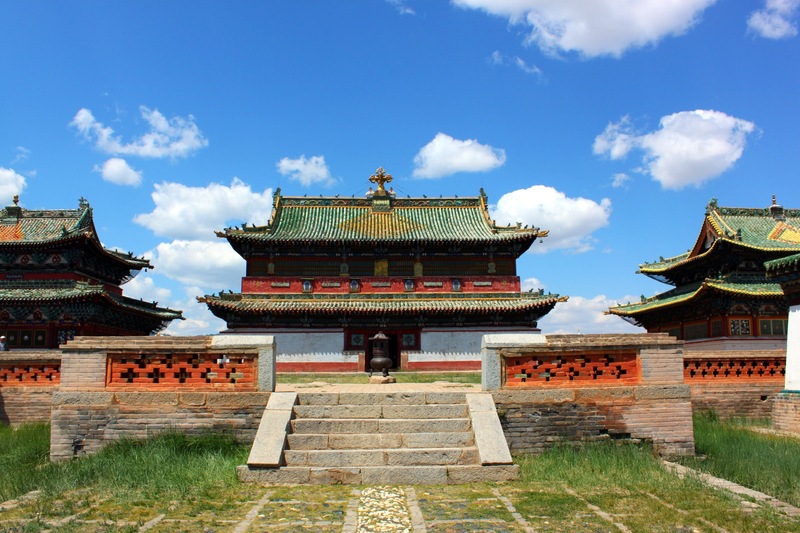 The original palace was built in the 17th Century for the second Bogd Javdandamba Hutagt Luvsandambiidundmid. Later the construction was complemented with several temples where regular religious ceremonies were held, so the ground became a real monastery. The 300-year-old khiid buildings have enamel ceilings and functional pillars with special pipes inside of rain drainage. The 1930-s purges were the most difficult times for the monastery. The Indian Lama Gurdavaa Rembuchii initiated restoration of the monastery. Now, it is an important Buddhist center with more than 30 lamas. Abtai Sain Khaan of Mongolia built the monastery on the ruins of Kharakhorum, the old capital of the Mongolian Empire in 1586. Mongolian architects headed by master Manzshir built Erdene Zuu using old Kharakhorum building foundations, stones and blue bricks. Erdene zuu walls, stupas, temples, statues and sculptures in the temples exemplify the high skills of the Mongolians masters. 17640 square meters of land is walled up for the Erdene Zuu compound. The walls have four big gates symbolizing the four directions and eight points. The walls consist of 108 stupas, 25 on each side and 2 at every corner. In the middle of the compound a big ger 20 meters in diameter called Bat-Ulzii was built in 1658. In front of the ger there was a hand made lake. Water pipes were laid from the Orkhon River to supply the lake with water. The two statues of gods in the front of the Zuu Soum were devoted to Abtai sain Khaan and his son Tusheet khan Gombodorj. The temples of Erdene Zuu contain an excellent collection of thangkas, tsam masks, wooden and bronze statues, appliquйs and papier-mвchй of various gods made by Mongolian masters in the 16th and 18th centuries. The original temple complex was built in the 1650s. Zanabazar came here to meditate and do his artwork. Many of his famous statues, including the White Tara now in the Zanabazar Museum in Ulaan Baatar, were probably done here. The temple complex was largely destroyed by the communists during the 1930s but has been recently renovated. Two monks live here year-round. Shamanism is the oldest religion practise in Mongolia and centers on beliefs and rituals associated with shaman, a man or a woman regarded as having access to the “spirit world”. Shamanism is a faith without books. All teaching and instruction has been given orally, passed from shaman to shaman over the centuries, and its traditions learned by heart. Mongolian shamans enter an ecstatic trance state in which the shaman is empowered to engage with the spirits I order to protect and heal members of the community, to guide souls and cure illnesses. The shaman might wear a headdress to resemble a bird, with the tail of pheasant and the body costume of a fish. Drums are used to help the shaman enter the trance-like state, as chanting begins and the shaman “transcends”into another world while the body dances, swirls or totters with jerky movements. Shamanism went underground during the former communist period , but has been revived recently.